We’ve been in touch with Spira for a few years, via Twitter initially, then via email and in person (we were interviewed for a project he was working on for the BFI). Turns out that we’ve got a lot in common, albeit from different sides of the counter. When The Raygun’s Tim Murray, almost 30 years in the industry, was writing, editing and working on an assortment of other trade magazines, VHE, View, timecode, RRP, HEW and others, Spira was reading on them from the assortment of video shops he was working in around the UK. He penned a piece for us on his time at Blockbuster after the rental behemoth, aka the Big Blue, fell into administration, discussing, among other things, its strange smell replicated at its stores around the UK. This was, without doubt, a kindred spirit. We’ve interviewed him again subsequently, when his most recent feature length outing, Elstree 1976, was released by Soda Pictures. At various times, we’d discussed his book about his time in a video shop, and I’ve been eagerly awaiting the arrival of Videosyncratic. In the video and wider film industry, the phrase “I’m working on a screenplay/book” is common currency, one you’ll hear in various forms (“I’m going to direct a film” and so on), ad nauseum. So when someone actually does it, rather than talk endlessly about how they’re going to do it, one can only stand back and admire. And, with Videosyncratic, Spira has done it and then some. Similarly, there are, allegedly, a handful of other memories of a bygone era, the VHS side and more, currently in the works, or at least there are according to some old faces who will often announce that they’re penning their own personal history of the rental business and other VHS tales. But Spira has beaten them all to the punch. Let’s start with the packaging – the slim-dimensioned volume is housed within a black Amaray case (retail, rather than rental-sized) and with a raft of stickers. It truly is a thing of great beauty – it will sit with my films, rather than books. As for the book? As one former trade press editor (John Hayward, for those veterans who go back further than a few years in the industry) said to me, “it’s a hoot”. It charts a life in film, and more specifically, video; one that should be familiar to many in the trade – first as a consumer, then someone working in store (its not quite Clerks territory, but it’s getting there) and, finally, as an owner. That’s a fairly simple explanation of what is a lovingly crafted book. Sure, we could nitpick over one or two of the names mentioned, one or two facts, but that would sopil the fun of the book and, to be frank, feels a touch churlish. This is Spira’s memories of days gone by, not The Raygun’s. It’s his story, he owns it. And it’s the list of names, not least Fast Forward (I once spent a night out with one of the company’s leading lights in Edinburgh, while combining a mystery whopper-style piece on the city, as well as interviewing the head office team at John Menzies about their retail video operation) that really works for anyone with experience of the industry. There’s a litany of long-forgotten names that reads like a mentioned in dispatches announcement of those that had passed. Spira’s honesty, about the rights and wrongs of the business, his openness about the customer service, offers fascinating insight into the way things were. Few at the time would ever admit that “this job would be great, of only it weren’t for the customers””, apart from the aforementioned Kevin Smith film, this book lays that wide open. This book can’t be recommended highly enough, with both an independent and chain-eye view of the rise and fall of a once dominant industry, albeit through the prism of someone outside and away from London, where the seismic decisions that both made and broke the industry were made. Sure, you know the outcome before you’ve started, but that’s not the point. His targets towards the end are not always spot on; one studio gets both barrels, not entirely fairly, in this writer’s opinion, but seen from the other side of the counter it would be different. Some of his points about supermarkets are a touch harsh too, although his railing against the pricing of DVD and how all-time great films can be bought for a few pounds, is bang on the money. Not only is it an epitaph, but perhaps it should act as an inspiration to anyone who wants to chart their own personal history of the video industry, a punk rock call to arms. Now, go and write yours. We’re going to. 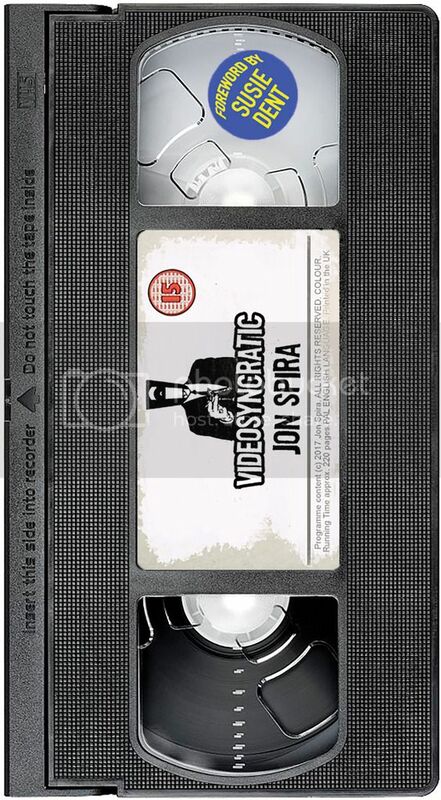 You can buy Videosyncratic here.